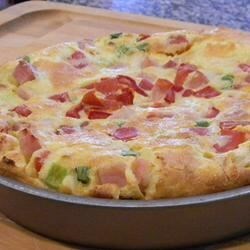 "This popover pie using curry and ham is perfect for breakfast, lunch, or supper. So quick and easy to prepare. It's attractive and tastes good, too. Top each serving with a dollop of yogurt and chutney." Lay the ham, green pepper and onion in the bottom of a shallow greased baking pan. Whisk the milk, flour, eggs and curry together until smooth. Pour milk mixture over the ham mixture. Bake for 35-40 minutes or till puffed, crisp, and nicely browned. This tasted fine, however it was definitely more of a frittata than a popover. Perhaps if some baking powder was added to the extra mixture. The only problem I had was guessing the size pan to put it in, I made the wrong choice and put it in one too large. Next time I will try a pie pan. Good and super-easy. I couldn't taste the curry at all, but my husband said it was good as is.